It’s a special day today. A day for takin’ it easy. But that is not what makes this day so special. 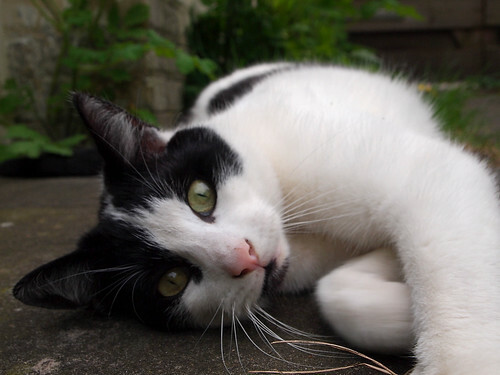 Taking it easy is Dushi’s core business. But today is Dushi’s birthday, the day he gets to do almost everything he wants. Luckily for Photoguy that ain’t much (today). 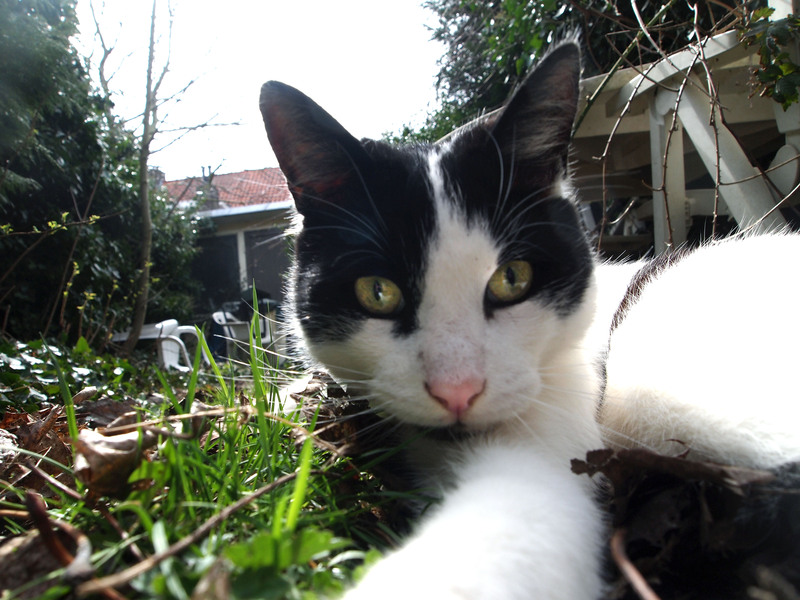 Dushi, a big cuddly layabout kinda birthday boy. Uncle Dushi has a big floppy tongue, but little Zeppo is not impressed. Anything he can do, she can do just as well. Dushi is taking some well needed rest after his big birthday party yesterday. Thank you so much for all the birthday wishes. So nice to see we are not forgotten, even though we are not around much any more. Climbing trees is fun. But let’s face it. If all cats were meant to do that, we would have been squirrels. Getting up is easy enough, but the getting down part can be tricky. Even for us. Remember Dushi first fall, or Paddy’s? Today we would like to tell the story of a kitten’s tree climbing adventure gone wrong. It could have ended disastrous had it not been for the hero who didn’t hesitate to jump in the cold water of a canal to save the little kitten. 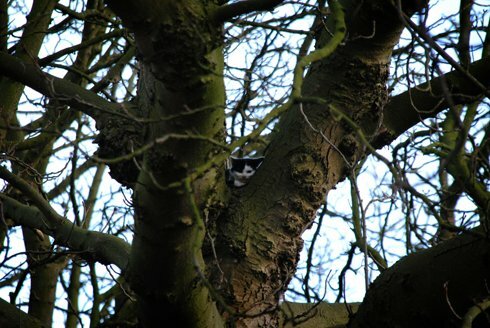 In the Dutch city of Breda a kitten got stuck in a tree. 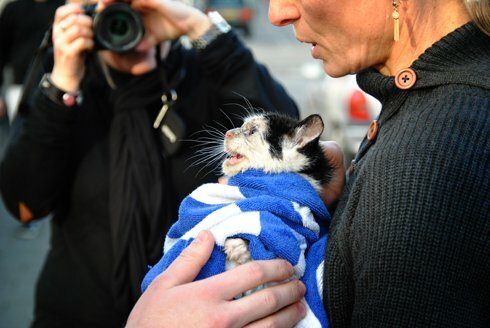 A fire truck rushed to the rescue, but the firemen weren’t able to help the kitten. It shied away from the scary machine and the big men operating it. (We would too). She retreated onto ever thinner branches. Too thin. The branches broke and kitten fell. She was able to catch a lower branch and hold on for a while. The hero of this story, Ruud van Kuijk, took off his jacket and tried to catch her. 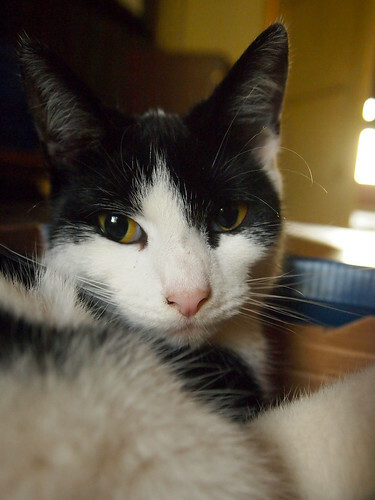 But when the kitten finally had to let go, she ended up in the middle of the cold cold canal. Out of reach for the other rescuers. Our hero Ruud van Kuijk didn’t hesitate for a second, took off his shirt, jumped in the icy water and saved the unlucky catintree. The photo’s on this blog are ususally made by Photoguy, but we like this story so much, we gladly present you the story as seen through the lens of Luuk Koenen’s camera. Click the link below to see the complete slide show. Enjoy. Photoguy bought himself some new shoes. Now I have this awesome box to live in. Hurray for Photoguy and his big feet. Dushi and Paddy are the son and daughter of Briti, daughter of Bertje. They live in Eindhoven, the Netherlands. We have our very own email adress: paddydushi@yahoo.com. Subscribe to new posts or comments. Some of the posts are inspired by songs. Now you can find links to these under the photo's. If you want to see them all, click songbook.